« American Flat Track. Superprestigio Live Stream Today At Noon Saturday December 17, 2016. Published by Cyril Huze December 18th, 2016	in Accessories, Builders, Customs and Editorial. Ride a with the convenience of Bluetooth® connectivity offered by the new Boom! 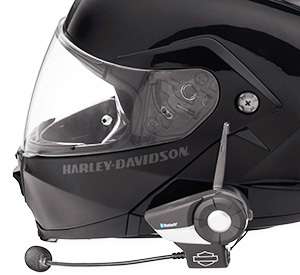 Audio 20S Bluetooth Helmet Single Headset (P/N 76000736, $299.95*) from Harley-Davidson®. 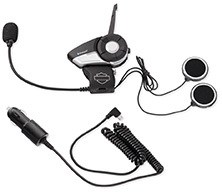 This state-of-the-art Bluetooth 4.1 communication system uses Universal Intercom™ protocol so it can be paired with many other available Bluetooth headsets for intercom conversations in full duplex with a passenger and/or up to eight other riders in crystal-clear HD® audio – up to 1.2 miles away – through the Group Intercom™ feature. Users can also call hands-free with a Bluetooth mobile phone and listen wirelessly to stereo music or voice instructions of GPS navigation by Bluetooth. The 20S headset features Audio Multitasking technology that enables intercom conversation while simultaneously listening to the built-in FM radio or Bluetooth-sourced music or GPS instructions. Audio Multitasking allows a seamless integration of incoming and outgoing audio, and eliminates the interruption-based audio functions of many Bluetooth communication devices. Complete control of the 20S can be accomplished through hands-free voice commands. The versatile jog dial maximizes ease of use for riders and pairs with two mobile phones. Talk time is 13 hours, and the device can remain charged for up to 10 days in standby mode. The package includes the headset unit, universal helmet clamp, two in-helmet stereo speakers, static and wired boom microphones, micro USB power and data cables, and all mounting hardware. This headset is not compatible with Harley-Davidson® original equipment Boom!™ Audio radio or communication systems. Available at more than 750 authorized retail locations in the United States and online. *Manufacturer’s Suggested Retail Price (MSRP), excluding taxes and shipping. Prices at local dealerships may vary. Apparently, according to info from Harley and reviews,it’s not compatible with the entertainment system on newer bikes. It pairs with phones and such. It’s basically an expensive intercom system. I’ll stick with what cam with my bike. The best I have found it for is 269 with free shipping. As someone else said, this is just a Sena 20s with the Harley logo pasted on — you can get it cheaper through Amazon. So, throw out those stupid fragile $180 wired Harley headsets, install a Freewire in your bike, buy a couple of Sena 20s headsets, (one for your passenger) and enjoy an audio experience the way it shoulda damn well been designed in the first place.